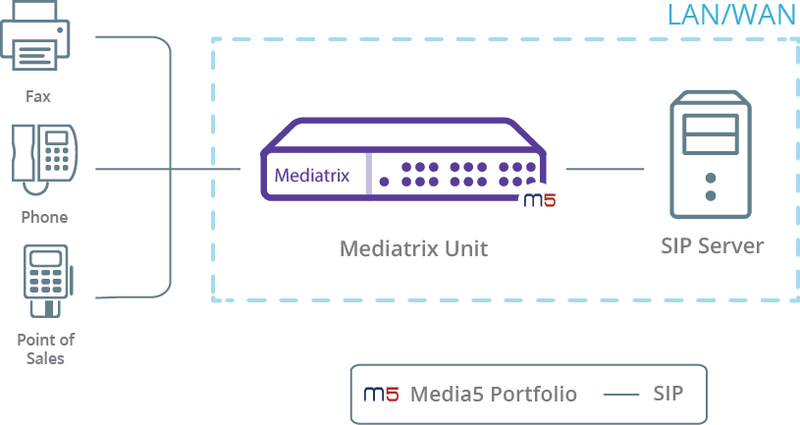 This configuration note describes how to use the Mediatrix units' multiple SIP gateways, keep alive and call routing features in order to maintain internal calls (between extensions) when the primary SIP server is down. When using the trunk SIP gateway type, the Mediatrix unit may require a SIP gateway username and password. These need to be obtained from your SIP server administrator. Go to SIP /Gateways . In the Gateway Configuration table, in the Name field, enter local . From the Type selection list, select Trunk . From the Signaling Network selection list, select Uplink . In the Port field, enter 5062. In the Secure Port port field, enter 5068. Click restart required services located at the top of the page. The local gateway will be available under the SIP /Servers page. Add the following lines to your text file. # Restart all the services that require it. Import the EnableEndpoint.cfg file to your system. Refer to the Importing a configuration script from a PC document. You can assign a specific messaging server to the default gateway, or to a gateway you have created. The local gateway must be created. Refer to Adding the Local Gateway . In the Proxy Servers table, from the Gateway Specific drop down located on the same row as local , select Yes . In the Proxy Host field, indicate the IP address or FQDN of the unit. This must be consistent with the value used when the local gateway was configured. The gateway will now use the specified server IP address or FQDN instead of the default server address. In the Keep Alive table, from the selection list, select SIP OPTIONS . In the Keep Alive Interval field, enter 30. This is the recommended value. From the Keep Alive Destination selection list, select Alternate Destination . In the Keep Alive Destination table, in the Alternate Destination field, enter the server IP address or FQDN for the local gateway and the default . The local gateway must point to the Mediatrix unit IP address and port if you did not use the default port 5060. This step is required if your server is configured to only receive 200 OK. This is not supported by all SIP servers, this feature is not mandatory in most use cases. Go to SIP /Interop . In the SIP Interop table, from the OPTIONS Method Support selection list, select Always 200 OK . The unit will always answer 200 OK to SIP OPTIONS messages received (Keep Alive). In the Hunt table, click located at the bottom of the table. In the Configure Hunt table, in the Name field, enter SIP . From the Selection Algorithm selection list, select Sequential . In the Causes field, leave the default values. The Hunt-SIP will be available in the Suggestion selection list of the Auto-Routing Destination field, in the Call Router /Auto-Routing page. In the Endpoints auto-routing table, click . In the Configure Auto-Routing , in the Auto-Routing Gateway field, enter default , local . In the Auto-Routing Destination field, enter hunt-SIP.